It’s finally here. After three quarters since being revealed to the world, a certain lineup of keyboards with obnoxiously bright individually backlit keys that spill copious amounts of light from beneath the keycaps are now more gaudy than ever much to our delight. 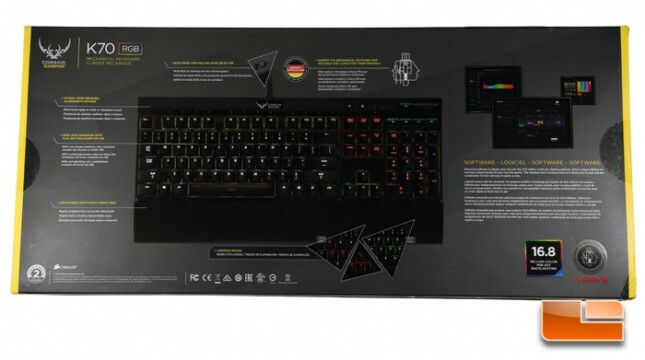 Multicolor RGB lighting for the Corsair Vengeance K70 and Corsair Vengeance K95 keyboards was first shown off at CES 2014 in January to much attention. For years, multicolor backlighting was a highly requested feature for mechanical keyboards. The vast majority of backlit mechanical keyboards only use a single LED color, but individually LED-lit keys have the benefit of luminous and highly visible keyboard lighting even in well-lit environments. Backlit membrane keyboards by contrast don’t have the luminosity to outshine even a nearby lamp, but the lighting mechanism usually used in these keyboards allows for multicolor lighting. The Corsair Gaming RGB keyboards are the first ever fully customizable multicolor backlit mechanical keyboards. Corsair worked with Cherry Corp. to modify the popular Cherry MX switch to use multicolor lighting, by changing the switch housing to a clear plastic and building a lens where the single-color LED used to be while an RGB LED would be surface mounted onto the circuit board underneath the switch. 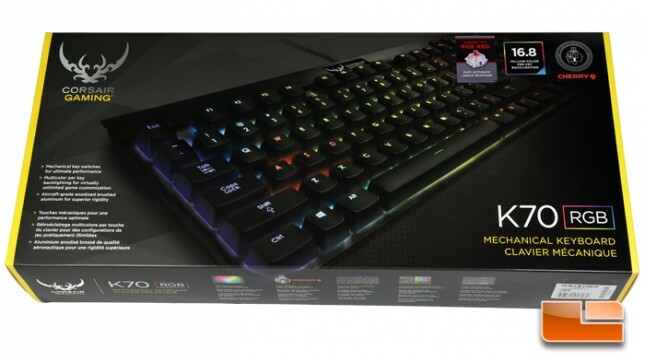 Corsair is not the first to roll out an RGB multicolor mechanical keyboard as Tesoro and Rosewill had them beat with modified Kailh switches while the Corsair RGB series remained unreleased for months since its reveal. Corsair’s new keyboards however are the first with individual key lighting customization are a result of the integration of an ARM processor and lighting controller to handle complex illumination patterns. 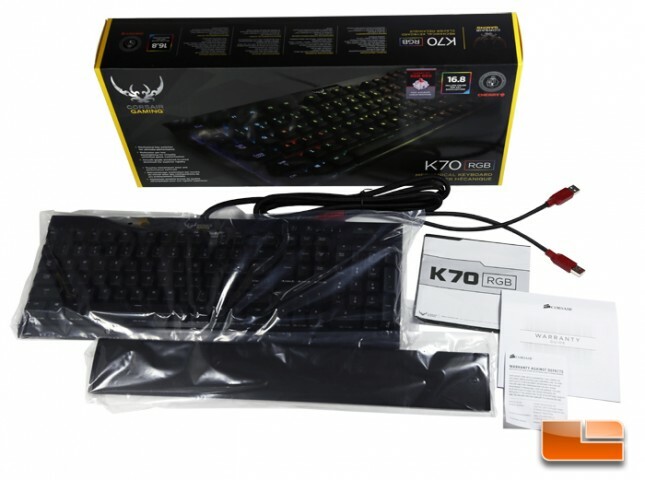 The K70 RGB is the standard layout keyboard of the three Corsair Gaming keyboards, the other two being the K95 RGB with 18 additional macro keys and the tenkeyless K65 RGB. These new keyboards update the 2013 Vengeance K70, K95, and K65 with Cherry MX RGB switches, full key profiling, and a new logo. These keyboards come with a 2-year warranty and are respectively priced at $169.99, $189.99, and $149.99. The Corsair Gaming K70 RGB comes with a detachable textured wristrest, a Multilanguage quick start guide, and warranty information slips. Drivers and a detailed user manual including explanations on how to use Corsair Utility Engine software must be downloaded from the Corsair web pages. The set of alternative textured keycaps that came with the original Vengeance K70 is not included in the K70 RGB. We’re still just getting started. On the next few pages, you’ll be able to see our many pictures of the K70 RGB keyboard! Additional pictures provided by Corsair, including of the K65 and K95, can be viewed from the official press release.